Bar Grating is widely used for pedestrian and light traffic applications. 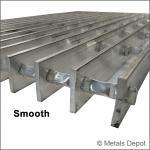 It is available in a range of metals, spacing, thicknesses, and heights, depending upon load bearing requirements. Aluminum Bar Grating (Swagged Aluminum Bar Grate) is lightweight, strong, and durable with high corrosion resistance. Easy to cut and weld, it is available in smooth or serrated finish. Based on how the grating will be used and its load bearing requirements, it is available in a range of spacing, thicknesses, and heights. 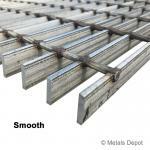 Shop for Aluminum Bar Grating Online! Shop for Galvanized Grating & Expanded Metal Online! Stainless Steel Bar Grating, primarily used for pedestrian and light traffic applications, is available in smooth or serrated finish for slip resistance. It is extremely strong, durable and corrosion resistant. Based on how the grating will be used and its load bearing requirements, it is available in a range of spacing, thicknesses, and heights. Shop for Stainless Steel Bar Grating Online! Steel Bar Grating, also known as Welded Steel Bar Grate, is extremely strong and durable. Widely used for pedestrian and light traffic applications, Steel Bar Grating is easy to cut and weld. Painted black, it is available in smooth or serrated finish. Based on how the grating will be used and its load bearing requirements, it is available in a range of spacing, thicknesses, and heights. 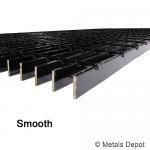 Shop for Steel Bar Grating Online!